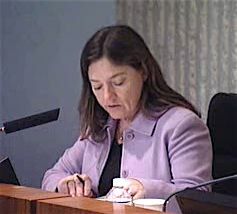 Well, at least the Costa Mesa City Council meeting on Tuesday, September 20th, finished that day. This one only ran five and a half hours instead of two hours longer, as was the case with the last meeting. And, I'd like to tell you that better decisions were made because the clock didn't sneak past midnight - but I can't. There were some highlights, though, so I'll start with those. You can watch the 5 hour, 22 minute streaming video of the meeting HERE. The council codified its decision to re-name a city park for World War I I hero, business and civic icon and role model for many in this town - Jack Hammett. Several options were available based on staff suggestions and Eric Bever - finally back on the dais - asked Hammett which one he preferred. Hammett said he liked the idea of the Civic Center Park, across the street from the Police Station, because he has spent so much of his life in and around the Civic Center. This is the potential site of a new Central Library if it is ever funded. 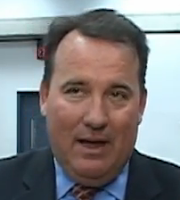 However, self-anointed Commander-in-chief, Jim Righeimer, dove in, ignored Hammett's preference and suggested re-naming the Farm Sports Complex for him. I'm not saying that's a bad choice - it's an excellent choice - but it made an almost perfect little ceremony more than a little uneasy, for Hammett and the folks in the audience. And, of course, it demonstrates just how obtuse Bever really is. The city is much better off when he's not on the dais. So, Jack Hammett will receive this much-deserved recognition and the youth of our city may learn a little more about one of the real heroes of our community. 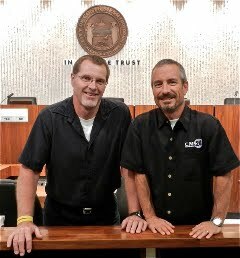 At the tail end of the meeting last night, just before 11:30, CEO Tom Hatch that Public Services Director Peter Naghavi has been elevated to the position of Interim Assistant CEO and that Naghavi's strong right arm, Ernesto Munoz, will be moved into Naghavi's slot as Interim Public Services Director. Hatch, apparently, has been unsuccessful in finding a candidate for the open Assistant CEO slot and has decided to re-launch his search. Naghavi and Munoz will occupy those positions for the "next couple months", which I read to mean through the end of the year. This is excellent news for the residents and employees of this city. Naghavi - the last remaining member of the senior staff who occupied his position a year ago - is a smart, solid performer and an effective leader. His presence on the 5th floor of City Hall - which has been filled for the most part with "outsiders" - may remove some of the "them versus us" stench that has permeated City Hall lately. And, of course, Munoz is a solid guy with a long track record of achievement in the city. This is a win-win for us, in my opinion. The other good news is that councilman Steve Mensinger apparently has his texting/bladder problem under control because, except for the break, he only left the auditorium once during the evening. I couldn't tell if he was texting much last night, but I suspect Wendy Leece would have told us - again - if he had been. Gary Monahan, titular Mayor, performed another of his agenda juggling acts and ended up shuffling the issues guaranteed to generate the most discussion - the three RFPs - to near the end of the meeting. By the time they got around to discussing these items from the Consent Calendar the crowd had thinned to mostly the "usual suspects", that small group of concerned citizens who take the time and energy to actually study issues and forgo a normal life to address their opinions to the council to help them make informed decisions. You know - those folks who are frequently vilified by members of the council who would just as soon NOBODY questioned their decisions. 4) Innovative and/or creative approaches to providing the services that provide additional efficiencies or increased performance capabilities. Each of those were to be weighted at 25% for the purpose of evaluation. Righeimer, in a near froth, demanded that they be re-weighted, giving 50% to #3, Price Proposal. The others were weighted as follows: #1 - remains 25%; #2 was re-weighted to 10% and #4 was changed to 15%. This almost guarantees that the lowest bidder, regardless of skills, qualifications, creativity and response to scope of service, will receive the job. 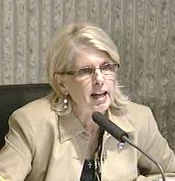 And, to further add to the intrigue, Righeimer demanded that all submission s be sent directly to former City Attorney Kimberly Hall Barlow at her office at Jones & Mayer in Fullerton, then subsequently transmitted to Hatch. This reeks of distrust of the city staff, especially since no good reason was given except by outsourced City Attorney Tom Duarte, who muttered something about providing confidentiality. The item passed, 4-1, with Leece voting no. She voted no on the others, too. The RFP for the Video Produ ction - which also passed 4-1, with the same provisions installed by Righeimer in the previous one - generated some very complimentary comments about our current team, Dane Bora and Brad Long. These men do an outstanding job, work long hours and are dedicated to providing an outstanding product for our city. In a city staff of outstanding employees, these two men arguably make the most visible positive impact on the residents. It's beyond me to understand why this function would be considered for outsourcing. As former employee and speaker Perry Valantine pointed out, since most of the budgeted costs - $200,000 - are covered by a grant, our current video production organization is the best deal in town - at $66,000 per year. The clue, however, comes in comments from Righeimer and Mensinger. Righeimer continues to yap about costs. It's clear that he doesn't want Bora and Long to be displaced - he just doesn't want to pay them as employees. 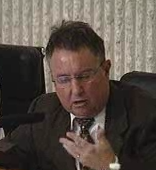 Mensinger stepped in a pile of manure when he, twice, suggested that Hatch and Duarte find a way to coach employees about how to become a bidder on outsourcing functions. It remains unclear whether this is an appropriate role for any city official, since no definitive response was given. It does, however, give us a peek into the peculiar mind of Steve Mensinger - who apparently has never met a rule he won't break if given the chance. This man grew up with a silver spoon in his mouth in a shallow pond of a town in the Central Valley - his family ran the biggest building supply outfit in town and his aunt was the mayor. He was sent to USC, where he apparently graduated with a degree in Arrogance - with honors. That's the course where they teach you that you should never hear the word "NO" - EVER! In that course they teach you that the rules are for others, but not you. They teach you the art form of turning the glad hand into a stiff-arm, a pat on the back into a knife between the ribs and that a criticism must always be preceded with faint praise so your victim drops his guard. The RFP for the Building Inspection Services also passed 4-1 and also with the same provisions required by Righeimer, although not without several commenters bringing up valid concerns - each of which were ignored. The low points of the evening came during Council Member Comments, which began at 11 p.m. Mensin ger led off and, among his comments, he included an indictment of our campaign financing policies. He's chagrined that if a person contributes $250 or more to a campaign, that candidate may not hear or vote on an issue involving that contributor. He described it as "surreal". Again, a rule designed to serve the public interest - but he doesn't like it and asked for our policy to be agendized for potential modification. He used a backhanded slap at Leece during his discussion - once again. A low-class guy is always a low class guy, I guess. He also wants a audit and assessment of the TeWinkle/Estancia and the Costa Mesa High School Foundations and how they spend the money on schools. I wonder if he's as concerned about the finances of Costa Mesa United, of which he is a member of the board? In any event, he asked Hatch to find out about the audit and to post the finances on the city web site so the residents can keep track of those finances. Righeimer was n ext up, although I'm surprised he had any arrows left in his quiver after the several mini-tirades he spewed throughout the evening. His first request was so jaw-dropping that it is almost unbelievable. He asked Hatch to have "this new person who works for the council" - whoever that is - to send out freedom of information requests to EVERY city in the county, including the county, for compensation numbers for EVERY person that works for them! No vote was taken on this item, even though it will clearly take much, much more than 4 hours of staff time to accomplish and maintain this data. And, just what will he - or we - do with this avalanche of numbers? SELL THOSE CHOPPERS - PRONTO! His next rant was about getting the A.B.L.E. 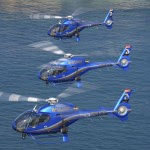 helicopters sold "right away" because they are a depreciating asset - "like ice cubes melting on the sidewalk on a hot day". He actually seemed surprised that they are not yet sold although three months ago he specifically instructed then-commander Tim Starn to hold off for 90 days before putting them on the market in case they could be used in a public/private partnership. The next item was his complaint about perhaps not recognizing the policy about approval being necessary for use of more than 4 hours of staff time! (See Above!) What a hypocrite! He was referring specifically to Wendy Leece's request for a policy on Ex Parte Communications - which he and Mensinger tried to morph and hijack into a "union only" rule. It failed, 2-2, when Monahan apparently decided to break with them on this issue for the good of the city. In this case, Righeimer wants to change the policy - he asked for it to be brought back - so the majority on the council can not prohibit a minority member from getting the staff time necessary to gather data and do analysis on an issue. On the surface, that sounds like a good idea, but I'm very, very suspicious about his motives. We'll see. POST THOSE WORKER'S COMP NUMBERS! He then launched off into a rant about the recent Orange County Register article by Jon Cassidy that outlined Worker's Compensation claim information that was, apparently, leaked to him from someone inside the city. Righeimer demanded that this information be made public so we can know the extent of this situation. He said he didn't want to see names, but I had the impression that somewhere back in his mind the word "yet" was lingering. He asked Hatch to provide that information. This was clearly another attack on union employees. Finally, he asked that Hatch bring to the next council meeting a method by which the council can enter into an exclusive agreement with one of the vendors for the operation of the TeWinkle Park Sports Complex that had been heard recently by the Parks and Recreation Commission. He says "we've got the cart before the horse" - I had to chuckle at that one, considering how we're handling the outsourcing - and that we need to have an agreement - "not that we'd sign an agreement with them" - from one of the vendors so we "know what's out there". Sure sounds like a guy you'd want to do business with, doesn't it? Geez! 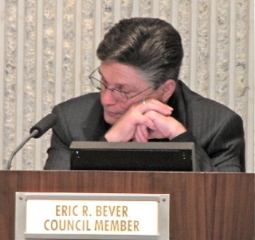 Bever was next, and began by agreeing with Mensinger about campaign reform. He said, "I wasn't tainted by it and I don't believe former member Mansoor was either. I never took a dime of union money." That's really hysterical - that he actually believes that union campaign contributions are the only potential source of campaign corruption. However, he asked Hatch to put campaign reform on the agenda for a future study session. Leece brought up the rear and presented some positive information about the recent Historical Society event at the Estancia Adobe and the very informative newsletter prepared and distributed by Diane Hill and her United Neighbors organization. She also mentioned that some crime numbers are up and gave the numbers. Interesting, both Mensinger and Bever assailed her for that. Mensinger pouted that he didn't have that information and Bever told her that they were incomplete and she should wait to close out the year before presenting this kind of information. What a crock! If our police department tells us certain types of crimes are up - as Leece said, robbery is up 11% from a year ago, burglary is up 5% and larceny and theft is up 12% - that's something that I, as a resident, want to know. I don't want to wait 4 months to hear about it, either. Lest I leave you with too bitter a taste in your mouth, one of the presentations made by Monahan earlier in the meeting was to Costa Mesa native Sharon Day, the United States Heptathlon champion for 2011. Sharon was a multi-sport star while in high school, a national champion in college at Cal Poly San Luis Obispo and has had a stellar professional career. I'm a huge track and field fan and have watched her career since her high school days. 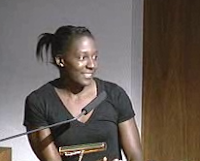 Her college coach is a personal friend, so I've followed her career closely. She's a person of whom every Costa Mesan can be proud. Congratulations to Sharon and her family. Hey Geoff......getting sick of the city yet? Dave Ellis is going to give us a revisionist history lesson regarding the Sale of the Fairgrounds, followed by a discussion of a DOA Citizens oversight committee, then they are possibly voting on booting the Swap meet. Should be fun, fun, fun. Pigheimer is definitely one arrogant SOB. The way he talks down to the residents and employees is just appalling. Just how many times can a guy lie and keep a straight face? I guess that's a necessary trait for a failed republican businessman who's ran all of his companies into the ground with his buddy Messy's help. Hey Piggy! Want the lawsuits to stop? Then STOP COMMITTING CRIMES you clueless arrogant lying fool!!! Do you really think us residents are stupid enough to buy into your lies and the lies published on the weekly e-briefings? Do you really think the employees will turn on their own union because of the lies you spew? Newsflash Piggy! Not only do all the employees know it, but also us residents as well, that if not for the union's involvement, EVERY one of the 213 employees that were handed pinkslips on March 17th would have been unnecessarily fired and replaced with worthless private sector workers. A perfect example would be the outsourced building staff the city has now. I can never get the same inspector as I did before and these guys seem clueless! I can't even get a live person anymore when I want to schedule an inspection! You're not fooling anyone Piggy! We're ALL on to you!!! Thanks for the blog Geoff! Thanks SO much for keeping us all abreast of our city councils doings. I have been having some health issues and haven't blogged in a couple of weeks. I didn't even watch last night. I didn't want the negative vibes to mess with my healing! These council meeting are such a joke that my friends and I stopped attending them. It's apparent the councilmen don't listen to a thing that the residents say. Moreover, when Wendy Leece calls them out for what they are and exposing them for who they are, they gang up on her to shut her up. Geoff, you should include the clip where Wendy Leece tries to put something on record about the real reason why hellthe council is outsourcing and Righeimer kept trying to shut her down. Righeimer is something else. What an arrogant failure that guy is and it's becoming more and more evident at every council meeting. "These council meeting are such a joke that my friends and I stopped attending them. It's apparent the councilmen don't listen to a thing that the residents say." There's 10 things I'd rather do on a Tuesday than schlep down to Fair Dr. and listen to the little general rant in his Richard Simmons voice. BUT, citizens shutting up and not showing up is exactly what the extremists are counting on. Our city ceased being a democracy several months ago. Time and time again the needs, requests, and concerns of the population are blatantly ignored. This city neds change and needs strong leadership to run these corrupt idiots out of town in November 2012. Even if you are anti employee and anti collective bargaining how can you support this regimes wasting money on lawyes and more high paying jobs for their friends? Certainly the residents should be listened to. and they are!! Righeimer made statements directly to what the residents had to say, what further proof do you need that he is listening?? He addressed all their hysterics and bending of the facts. I suppose you want the council to do a complete 180 (excluding Leece who already has) turn and VOTE the way the residents (all six of them who speak on every issue) tell them to? That is unreasonable to expect unless you make a very strong case that could change their minds. The only thing that is said to council, beside the insults to them, is emotional dribble: don't change, you are changing too fast, we like our cops, etc. The council is addressing a financial time bomb and is very dedicated to doing so. Having them do the wishes of the unions, Genis and her group and go against their own philosophy is absurd. They listen, they just don't hear a reasonable statement most of the time. "..I suppose you want the council to do a complete 180 (excluding Leece who already has) turn and VOTE the way the residents (all six of them who speak on every issue) tell them to?" We no vote what citizens want, we vote what best for us only. Costa Mesa no democracy, just stepping stone for Riggmarshal. I have observed that Council critics like Geoff West will be critical, to a fault. I think a great story for someone would be to consider that if Costa Mesa had taken the position of a Santa Ana, where would we be? Mid year, ooops, $30 M short? They followed Union recommendations to use pots of found money and to accept inflated revenue exaggerations and to not plan with contingencies. I get that some, fewer by the day, may not like the how. I say, get over it. I have not seen any good arguments against the what or the why. I think Greg Ridge and Perry Valentine are both a broken record on this topic, and also miss the point. It is not about Nordstrom. A modest increase should be considered in November, as should a way to invest those funds in technology and infrastructure to help our business community. You know what is a better recommendation, one that might be able to be done today? Why not outsource to a resource that could take a look at making sure everyone is complying now. All these gypsie businesses. Go over around the Performing Arts Center, look at those high rise office buildings. OC’s biggest and best law firms call it home. Newport Beach triggers a Business License requirement communication based on filings. I wonder how many thousands of dollars sits in those filing cabinets alone. And, action can be taken today. That would boost revenues and prepare for Nov 2012. Those same stickers were all over Mesa Verde. specific and actionable, before you go off trying to make yourself sound smart please review the difference between the words access and excess, since you have done nothing but prove your dumbness. In case you need clarification; you are an idiot. Nice try. Our city would be so much nicer without Righeimer. Let's hope we get some good people in 2012.